Here at Tithof, we’ve had a soft spot for tile since our company launch. ‘Tile’ is in our name because it truly is our original area of expertise. Our Northbrook showroom has an abundant selection of stone, ceramic, glass, porcelain and specialty accent tiles. To further accommodate our customer’s unique designs, we’ve partnered with many manufacturers of domestic handmade ceramic and mosaic tiles. 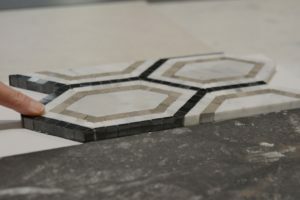 Handmade tiles are unique in color, shape and form because of their individuality in creation; resulting in beautifully unique tiles for your project. 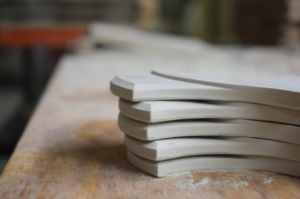 Handmade tiles are also typically hand glazed, allowing complete control or lack of control in quality and style. Depending on the vendor, you will see many different varieties of acceptable range. Because of this we ask that you allow our designers to assist with the right fit for your project. Do you like a tight joint? Will you accept glaze variance? Will a clay bubble be an eyesore or beauty mark to you? What is your lead time? All of these factors will impact the correct handmade vendor selection. Whether your powder room is outdated, you’re building a new home or it’s time for a kitchen remodel, let our in-house design team guide you through the entire process. From floors to backsplashes, and everything in between….we do it all and are here to accommodate your design and budget needs.